Slow Cooker foods are what we’re all talking about in this weeks edition of #SundaySupper. 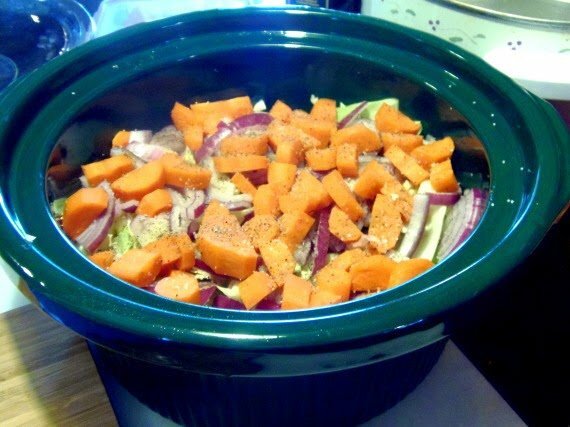 If you haven’t jumped aboard the slow cooker bandwagon, what are you waiting for? 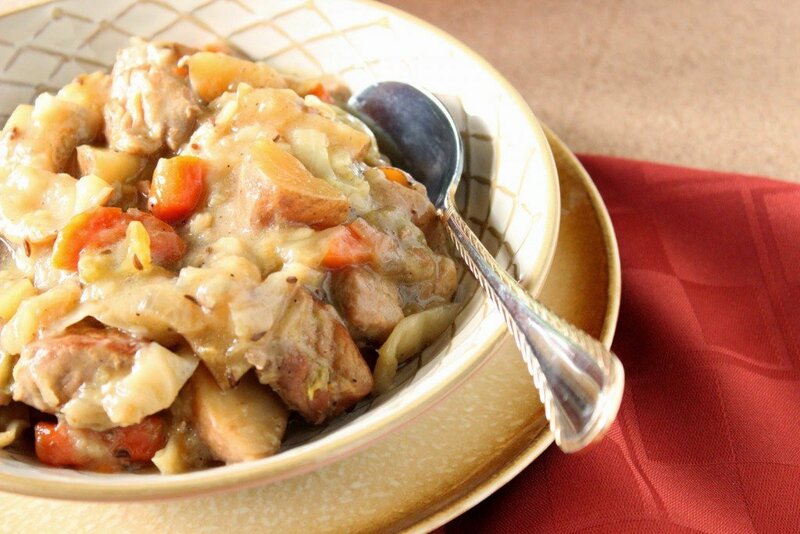 With just a few minutes of preparation in the morning, you can have this amazing dinner of Pork and Cabbage Stew waiting for you the moment you walk in the house later that evening. It’s that simple! 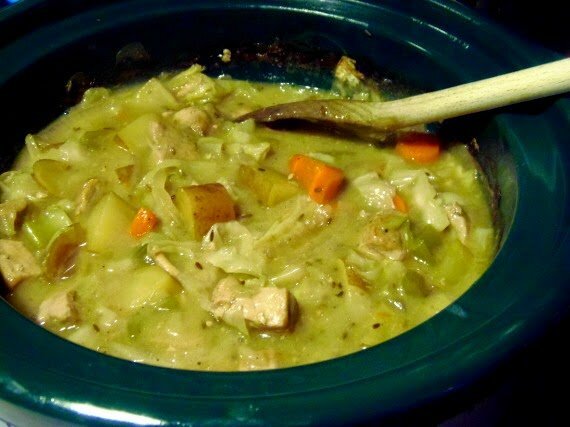 This Pork and Cabbage Stew is something I actually posted a few years ago, but I haven’t made since so I’m considering this a recipe-redo. I’ve only made a few small changes to the original recipe. I increased the amount of pork. I added some chopped celery. I decreased the amount of cabbage I used (with the increase of meat, I didn’t have room for all the cabbage), and I changed out the type of oil I used to brown the meat. I also modified the technique of putting it all together to make it a tad faster and easier…Other than that it’s basically still the same, and the taste is just a good, if not better than I remember! 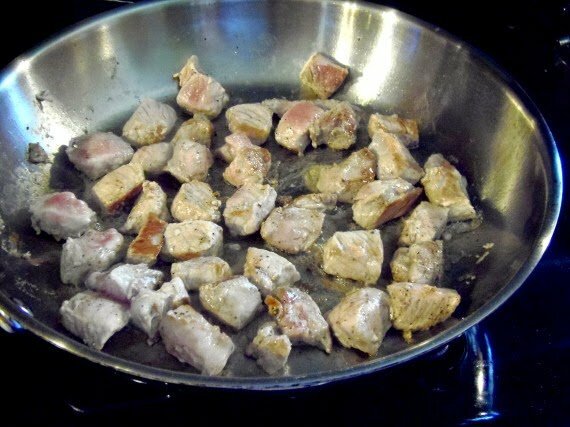 -In a large skillet over medium/high heat, brown the seasoned pork on all sides in the canola oil. 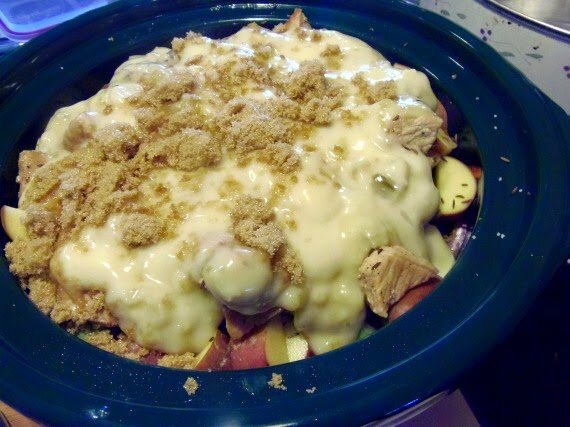 -Place half the browned meat in the bottom of the slow cooker. 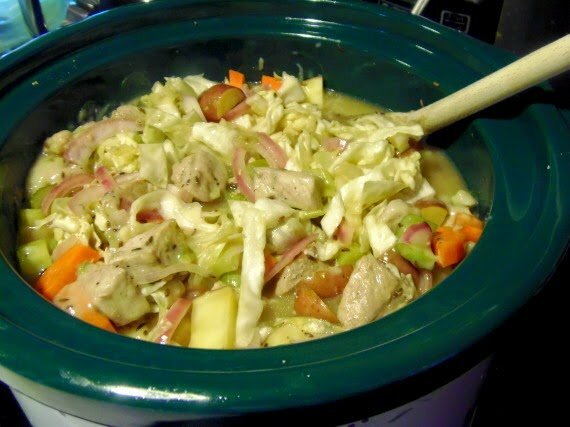 -Layer the onion, cabbage, potatoes, celery and carrots on top of the meat. -Season with the 1 teaspoon salt and 1/2 teaspoon pepper. 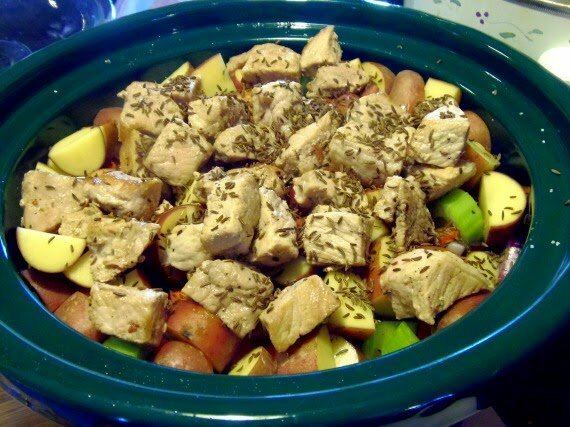 -Layer the additional meat on top of the veggies and add in the caraway seeds and garlic. -Spoon the soup on top of the meat and then top with the brown sugar. -Pour the apple juice and apple cider vinegar over the contents and cover. -Cook on low for 8 hours, or high for 6 hours, stirring halfway through if possible. -Shortly before you’re ready to serve, stir in the butter. You know I love the German flavors in this dish. It would be a bowl of comfort for me. 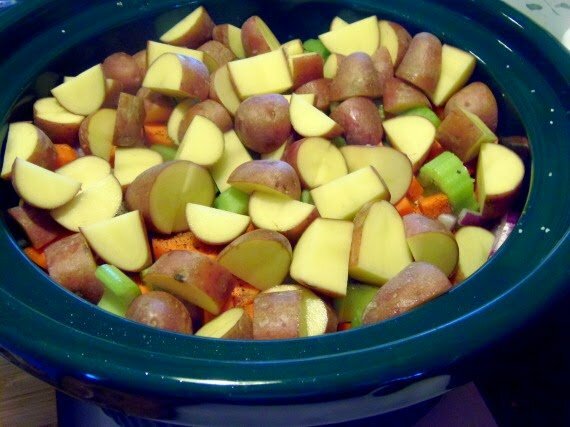 This all sounds perfect to me and will be in my crockpot very soon. 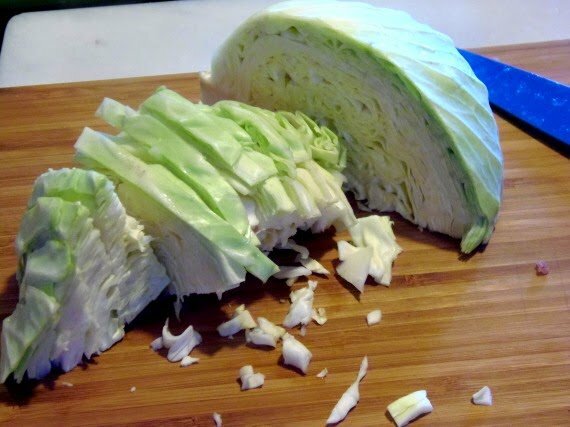 I'm such a cabbage fan. That looks absolutely delicious. Only if I could smell all those wonderful flavors. 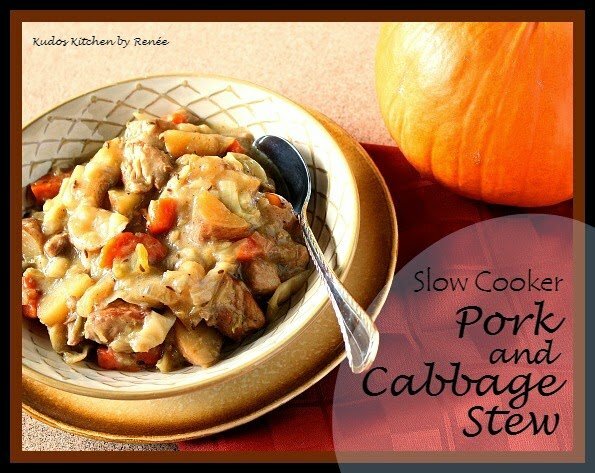 I love the combination of pork and cabbage and preparing this dish in the slowcooker makes it even more appealing. Yum! I seem to gravitate to chicken or beef when using my crock pot, but you've convinced me to go to pork next! What a hearty, delicious stew! Smothered pork with cabbage is a family favorite at our house so I know your version with added potatoes would be a big hit. Great recipe, Reneé! 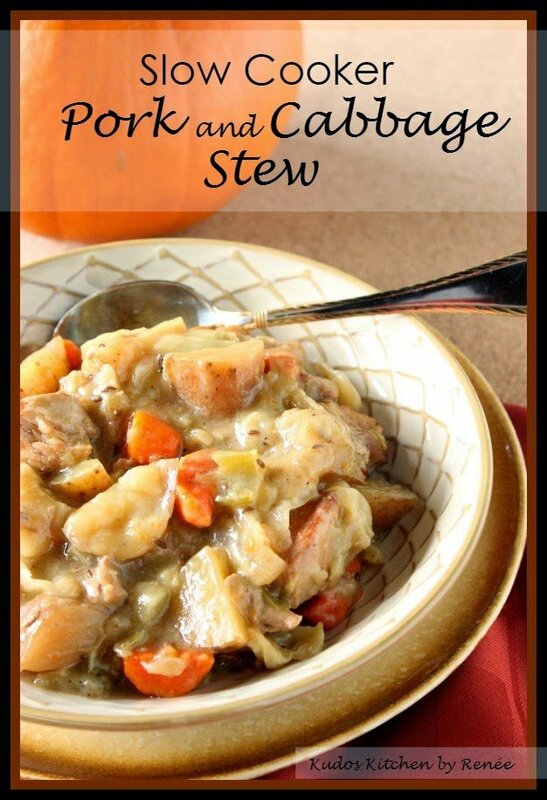 A nice hearty stew in the fall made with the ease of a slow cooker it always a home run in this house. What a great recipe!! This looks so hearty and delicious! Wish I had a bowl for lunch!! Pork and cabbage love it together! This sounds stick-to-your-ribs good! Perfect for cooler weather. This is such a perfect fall flavor combo! I’m so sorry that I forgot to add the word “cups” to the apple juice measurement. Thanks for bringing it to my attention, Sharyn!